TAWN » Monthly Meet up! Contact Us Pagan Friendly Businesses Document Library Local Groups Web Links Festivals Open Rituals Monthly Meet up! Community Classes / Service Membership Information Tapestry Board and Volunteers Articles / By Laws / Ethics About TAWN Hail and Welcome! TAWN meetings, open to all, are held at our monthly Cauldronlucks (what else do you call a potluck for Witches?). These occur on the 2nd Sunday of each month (except the 3rd Sunday in May, in deference to Mother’s Day). The business part of the meeting begins at 11:00 AM and the Cauldronluck and Social part of the meeting begins immediately after the business meeting. This is an outdoor location with a limited amount of seating, so we want to encourage people to bring chairs or blankets to sit on. All Cauldronlucks begin at 11 a.m. after the Ramanda Clean up, which is from 10:30-11:00. Members of TAWN are strongly urged to attend the monthly business meetings to have a say in what TAWN does in the community. 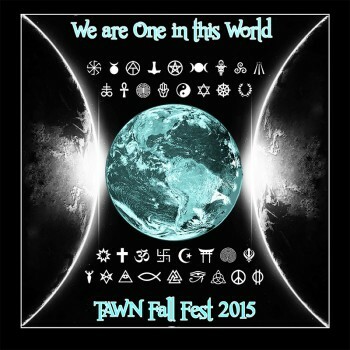 TAWN members are the force behind TAWN. The TAWN Board is merely the “eyes and ears” of the community and will bring concerns and propose changes to TAWN to the membership in attendance at the business portion of the monthly TAWN meetings. The newest minutes can be found on the right side under Posts by Categories. The 2012-2015 Meeting minutes can be found Here! The TAWN Newsletter will come out at least monthly, and contain the minutes from the last meeting. Please add newsletter@tawn.org to your address or "safe" list so it doesn't end up in your junk folder.